The Babyidea merino Longies are a natural alternative to diaper covers of man-made fibres, there is nothing as great for diapering! Merino wool allows moisture to evaporate (reducing dampness) and aids to the maintenance of optimal skin temperature. Lanolinising makes wool both water resistant and self-cleaning. Not even advanced modern technology can replicate the comfort, durability, softness and security that pure merino wool offers. 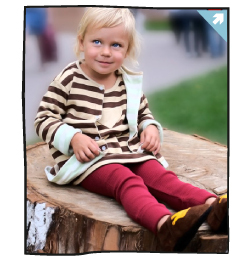 The Wool Longies are carefully designed in Finland. 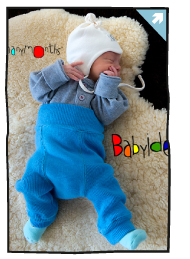 They are made of two layers of naturally stretchy and soft merino wool rib, which has been knitted especially for us. Our Shorties & Longies are cut quite high to provide a long time of use and a good fit for different types of inner diapers. All seams are sewn flat and the ribs have good stretch, which makes dressing easy. When using Longies you don't need any other pants on top. Easy and convenient when cloth diapering, plus very comfortable for the child with less bulk than other diaper solutions. The Wool Longies don't need to be washed after every use. Wool cleans itself; frequent airing of damp pants in fresh air will do. The reliability will improve over time. Wool is meant to be loved and used often. 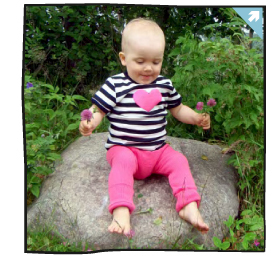 The Longies are available in sizes XS, S, M, L and XL, which is from preemie to 3-4-year-old toddler. The sizes are overlapping and all of them have a high waist for keeping the important inner organs warm and preventing diaper leaks. Also perfect on top of disposables at night or during the colder season. When the biggest size doesn't fit any longer or the diapering time is over, change into ManyMonths Unisex Leggings.